- Brett showing Danni and Cheryl the ‘beard' he's growing and worrying about learning his lines for the school play. - Marlene commenting to Cody that she could sell some of Julie's clothes in the shop – but adding that she feels ghoulish about it. - Annalise telling Cheryl that, according to the questionnaire in her magazine, Lou is having an affair. Mark and Rick burst out laughing! Rick grins that Agnes sounds beautiful compared to his, and he refuses to reveal what his is! Mark comments wistfully that he wishes *he* had ceremonies like that; the only ceremonies he's had were with his parents' hippy mates chanting at the sun! Annalise heads off, leaving Rick to assure Mark that he's not missing out on anything! Danni is at No. 24, where Marlene is commenting to her that Lou is *crazy* about Cheryl; why would he be running after someone else? She then reveals that it's the opening of her shop tomorrow – starting with a half- price sale. Danni asks if that's a good idea for a new business, but Marlene explains mischievously that she's marked the prices up a bit before halving them! Annalise comes in and Marlene asks what she's been doing. Annalise explains that she and Mark have been to see Father Michael. Marlene asks her sharply if she confessed that she's been stirring up trouble for Lou and Cheryl. 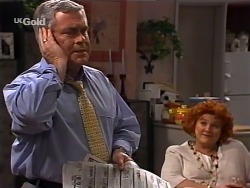 Lou is reading from the newspaper, telling Cheryl that the newly- formed Erinsborough Radio station is looking for sponsors and saying he might put Carpenter's Cars forwards. He adds that the station also want volunteer announcers and he reckons that might be right up his alley! He suggests that he could announce the Eyewitness News! 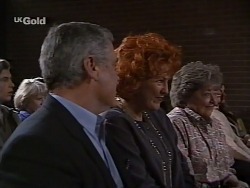 Cheryl, however, grins that there's only Earwitness Gossip in Erinsborough! 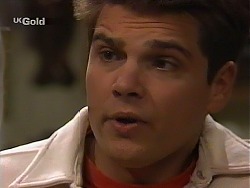 Lou looks at her seriously and tells her not to believe Annalise: he's *crazy* about her. 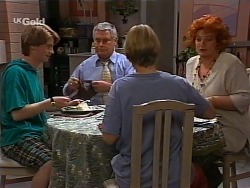 Mal is complaining to Billy, Karl, Susan and Libby that he doesn't see why he should have to go to the school play – *they* don't come and see him play football. Karl calls a family vote and everyone votes in favour of Mal attending! Mal then says he wants to raise the subject of Stonefish being Billy's bodyguard. Billy comments that Stonefish is great. Mal insists that they don't need him. Susan, however, says that while Billy is learning self- defence, she thinks Stonefish should stay until he's no longer necessary. Libby nods that she agrees and Mal is outvoted again! Mark is looking at a leaflet and Rick comments that he's really into that stuff, isn't he? Mark comments that he reckons Annalise is going to get the shock of his life when he tells her he's decided to be baptised. BRETT: Yeah, right: tonight I get to kiss Libby Kennedy for real. DANNI (teases): Yeah – on stage, in public! Brett pleads with Danni to tell her his special system for remembering her lines, but she refuses and goes back to bed! Sam has put up the scenery for the school play, but Ms. Stoner comments in surprise that it's quite sparse. Sam shrugs that she only gave him a few bucks. Susan joins them hands Ms. Stoner some costumes. 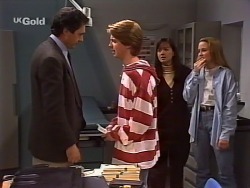 Butza walks over and shows Ms. Stoner a revised version of the script, which Ms. Stoner takes to read. Butza then turns to Susan and sighs that she doesn't know if her play's any good anymore. Mark is with Rick, looking at a bible. Marlene is selling some goods to a woman. 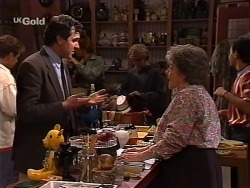 Karl approaches the counter and asks Marlene if she has a man's hat from circa the 1920s. At that moment, though, Billy finds one. Marlene joins Annalise, who remarks that there's so much stuff there. She finds a dress on a rack and comments that it looks like it's hardly been worn. Marlene explains that it was Julie Martin's. Annalise quickly puts it back! Brett is walking along the street, saying his lines out loud to himself, when Libby catches up to him and says they'd better hurry up as they have to help out backstage. Danni joins them and asks if they're coming to her nan's shop. Brett and Libby, however, say they've got things to do at the school. Libby asks Danni if she doesn't want to learn her lines, but Danni insists that there's plenty of time! Karl and Susan are in Karl's consulting room, where Karl models the 1920s cap he bought from Marlene. Susan looks at him – and then her face drops and she comments that she's got this awful feeling that she's going to forget something really important. Libby and Brett come in and Brett tells Karl that he's a bundle of nerves and he doesn't think he can make it through the play tonight without some help. Karl just prescribes deep breathing. Brett tries it – and just about manages to avoid hyperventilating! Marlene is telling Cheryl and Annalise that she's had a good day. Lou comes in with some of his old clothes, before then taking Annalise aside and telling her coolly that he doesn't appreciate her telling Cheryl that he's having an affair. Annalise apologises. Lou and Cheryl go to head off to the school play. Mark tells Annalise that they have something important to discuss. Backstage, Ms. Stoner is trying to organise everyone. Butza asks everyone to please remember their lines, as she sweated blood about this play. Brett takes Danni to one side and asks her to please tell him her secret for learning lines, now. Danni tells him that it's really simple: she copied out all her lines in huge writing and stuck them behind the scenery and some of the furniture, so wherever she is she can read them out! Susan, who's standing nearby, muses that it would have taken the same time to *learn* them. In the main school hall, Marlene, Lou and Cheryl are seated and Marlene comments that this is exciting! Behind them, Mal mutters to his Karl and Billy that *someone's* excited. Backstage, Ms. Stoner is giving everyone a pep talk. Brett joins them and Libby comments that he looks terrible. She asks if they should get his understudy, but Brett quickly insists that he's fine – before dashing off to the toilet again! Packo starts playing the piano and the curtain goes up. Annalise and Mark are looking at wedding dresses in magazine. Annalise comments that she thought it would be an idea to get Helen to make a copy of a dress. 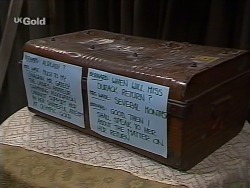 Mark tells her that *he's* had an idea too: he wants to be a part of all the religious ceremonies by being baptised. Annalise looks at him in astonishment and comments that she remembers when he didn't even want to go in a church. Mark shrugs that he reckons it would be hypocritical to get married in a church without being a Christian, so he wants to become a Christian. DANNI: Oh yeah, that's it. Sometime later, Brett is sitting onstage alone, delivering a monologue. 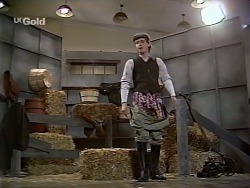 He stands up – and his trousers start falling down, revealing his brightly- coloured boxers underneath. The audience bursts out laughing again – until he realises what's happened and runs off stage! Later again, Brett is ‘proposing' to Libby. She accepts his proposal and the two of them kiss passionately. The curtain closes and the audience applauds! Backstage, Ms. Stoner congratulates everybody! LIBBY: You know how I always said he was a total dweeb? LIBBY: I was wrong, totally wrong. After tonight, I reckon we're made for each other. The way he kissed me on stage was incredible. Just blew me away totally. BRETT: There she was, in my arms, just as I had imagined… and then we kissed. BRETT: And I couldn't believe it: Libby Kennedy is wetter and colder than a fish!